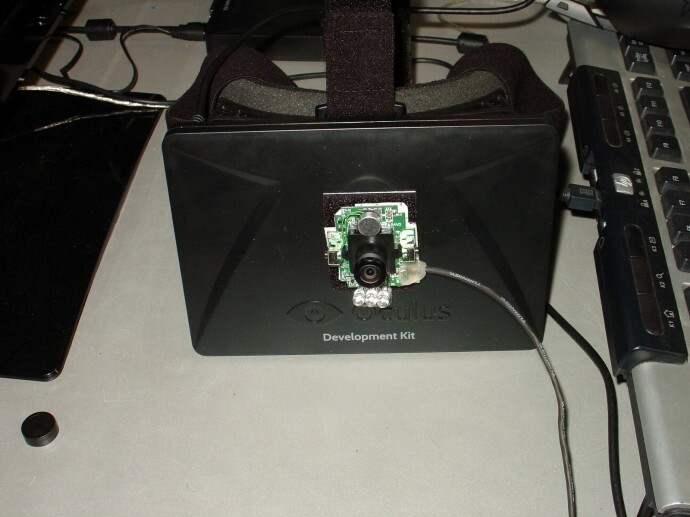 You’ve probably noticed that I’ve been playing mostly with the Oculus Rift Dev Kit since I’ve got my unit and the good thing is that even though so far only about 2K development kits were shipped the community is very active and there are new development around the Rift all the time. Now, since the Rift covers your vision completely and when you put on headphones for the sound you kind of get completely cut off from the “real world”, and though that this has advantages it also brings some disadvantages. Like having a hard time finding the keyboard or the mouse on your desk without taking off the Rift, so I’ve decided to see what can we do to easily get around this problem. The solution is actually quite simple – add a webcam with a wide angle lens so that when you are wearing the Rift you can switch to the camera and see your desk or what is happening around you. I’ve had a suitable webcam around and by replacing the standard lens with a wider angle one I got this simple and easy to use solution working almost perfectly. I’ve mounted the camera with Velcro in the center of the Rift and then fired up the Stereoscopic Player with Live Video mode on and the monoscopic camera input set to output using the Oculus Rift viewing method. The web camera is with 640×480 resolution and 30 fps and that seems to work quite well, it also has a set of LEDs for use in dark environments (including a set of IR LEDs) and plugs via USB, it also has a microphone, though I was not able to make it work under Stereoscopic Player. Now, you can easily extend this solution by adding two web cameras f the same model on your Rift to get a stereoscopic 3D video input with the help of the Stereoscopic Multiplexer dual-camera capture solution developers by Peter Wimmer, the author of the Stereoscopic Player. 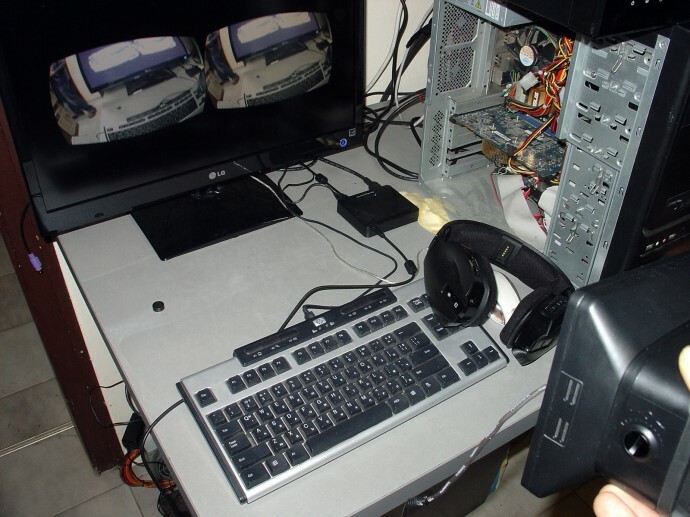 You need to run the Stereoscopic Player in full-screen mode and you can switch between it and the currently running Oculus Rift-compatible game or application by the key combination ALT + TAB. The only drawback here is that you need to be able to hit the key combination, but you can thing of something more creative to be mapped to that combination to make it easier two switch between the two. It works surprisingly well and is a modification that everyone should be able to easily make, even with two cameras for stereo 3D video input (placed at the right distance based on your IPD), the key thing is to use a wider angle lenses instead of the standard ones that would probably be with a narrower angle. Even though the main focus of the Oculus Rift is virtual reality experiences, many users would also want to be able to use this HMD device for other simpler things like playback of 2D and 3D video as well. The good news is that the latest version 2.0.5 of the Stereoscopic Player released earlier this month brought support for 2D and 3D video playback on the Rift, of course there is no support for the head tracker, but you don’t need it for video playback anyway. 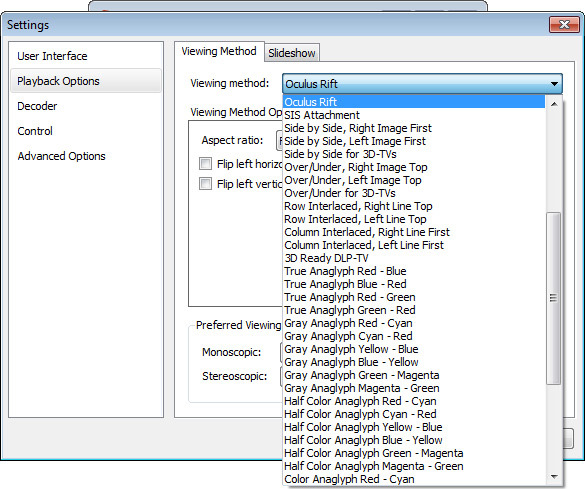 To enable the right viewing mode just select Oculus Rift in the Settings under the Playback Options panel and the videos you open either in 2D (monoscopic) or in 3D mode (stereoscopic) will be rendered with the correct optical distortion required by the Rift. The playback of both 2D and stereo 3D videos with the Stereoscopic Player on the Rift works quite well with 3D videos obviously being more impressive than the flat 2D ones that just show the same image for each eye. 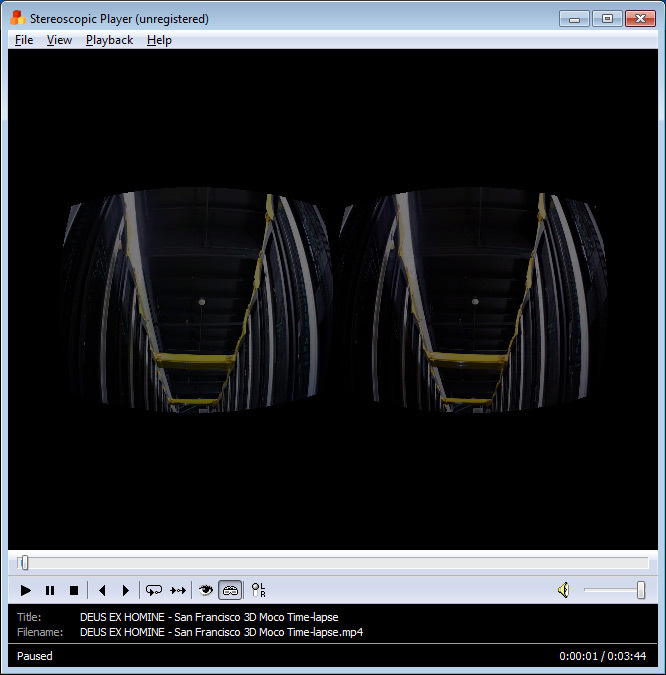 A stereo 3D video with more depth can look quite impressive when viewed with the Oculus Rift. The only drawback however is that when viewing 1080p 3D videos they need to be scaled down and there is quite a lot of vertical screen space left unused because of the wide aspect. As a result you may be able to notice the top and bottom edges of the video frame when watching the video with the Rift, so have that in mind. 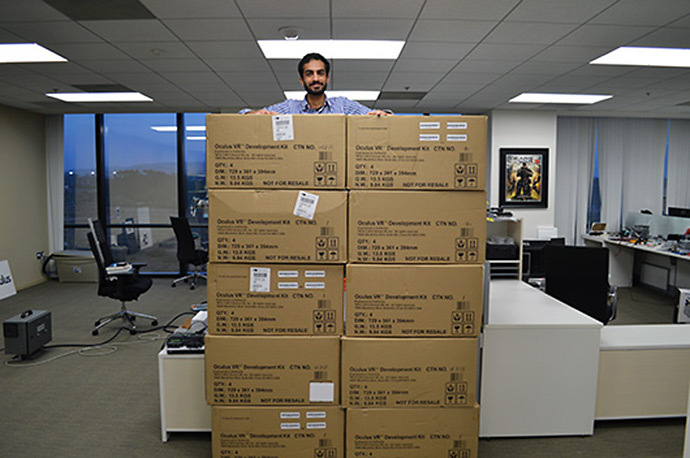 The team at Oculus has reported that they’ve managed to ship roughly 1850 development kits worldwide so far (out of which 500 internationally) with another ~2000 arriving at doorsteps around April 26th, but it could be a few days earlier or later depending on international customs. Of the upcoming ~2000 unit batch, ~500 will be shipped to Europe, ~500 will be for Asia/Oceania, and the rest will be to the Americas. These units will also be the first delivered via the new EU/Asia/Oceania fulfillment network, which should help reduce delivery times and costs. So it will take some time until all of the 10K+ units get shipped. Fortunately I’ve already got my unit, even though I’m based in Europe, the early backers with DIY kits like me apparently had priority. The Oculus Kickstarter t-shirts and posters are also ready and should be shipping worldwide starting next week (shipped separately from the dev kits). Meanwhile iFixit have made a teardown of the Rift, so if you are interested in finding out what is inside the Rift you might want to take a look at their complete Teardown of the Oculus Rift. This can save you the need of having to disassemble your unit if you are curious or if you plan to mod something on your Rift and are not sure if your modification will be possible, or if it will fit in. And here is another teardown of the Rift, this time on video, made by Michael Moffitt. On his website you can find something else that might be of interest for Oculus Rift owners, an Oculus Rift USB power hack that would allow you to run the Rift off USB power only without the need of the extra power adapter, making the Rift more portable and having to use less cables. Be warned that you may face issues with this mode on some USB ports if you have other peripheral devices connected that tend to draw more power.